I can’t think of any recipe I’ve made recently that’s given me as much angst as Mashed Cauliflower. See, I love cauliflower. Cooked almost anyway and raw, too. And I love my One Pot Mash in the Pan Instant Pot Cauliflower Rice. So when I started hearing about Mashed Cauliflower as a lower carb alternative to Mashed Potatoes I just knew I would love it! I jumped on it. And I hated it. It wasn’t until I started combining the Mashed Cauliflower with Parmesan cheese for Parmesan Mashed Cauliflower that I began to like it. The issue with the mashed cauliflower recipes that I was trying wasn’t so much the taste (although they were surprisingly bland) it was the texture. Cauliflower, it turns out, is so moist that when it’s pureed has a very light, soft texture. It looked gorgeous in all the pictures I saw but it was like eating a very wet baby food. It was like eating a cheap cauliflower flavored applesauce. And processing it less just made chunky wet baby food! So being a cauliflower lover, and also a person who has made vegetable purees other than mashed potatoes (hello, my beautiful Pureed Parsnips! I love you!) I wasn’t gonna give up! The very first recipe I tried was boiled but so wet that I actually strained it. That made it a little better, but still not great, and besides, who wants to strain cauliflower? Not me. And probably not you! So I moved on to steamed and pressure cooker recipes. And they were a bit of an improvement, but still not great. By now I starting to feel like a; prison inmate, forced to eat crappy food. Held hostage by the cauliflower! I wasn’t going to waste it, though, and I knew it was good for me, so eat it I did. Even Chance (my labradorable as I call that scamp) had a bit mixed with his food! Finally, I had an “Aha” moment – what if I could heft up the texture and improve the flavor with cheese? Cheese and cauliflower? C’mon! It’s fantastic together, like in this Cauliflower au Gratin. Turns out that regular cheese does nothing for mashed cauliflower, but what did the trick was the Parmesan cheese in the green can. Yeah, really! So I’m posting this Parmesan Mashed Cauliflower with pictures that really show the true texture, not just the ones that look like mashed potatoes. I’m posting with the caveat that Parmesan Mashed Cauliflower can be a decent lower carb alternative for mashed potatoes, but you are NEVER going to trick your family (or yourself) into thinking that Parmesan Mashed Cauliflower is mashed potatoes like some people claim. They are a whole different animal. The biggest surprise, though? They were even better the next day. Steaming, whether on the stove in a pot with an insert or under pressure in a pressure cooker or Instant Pot is the only way I’ve found to get a decent cauliflower mash, or at least the only way without a lot of heroic cooking tricks. Keeping the cauliflower in rather largish (for the most part) chunks, about three inches across or so, helps, too. If your cauliflower mash still seems to “wet” for you, it can be saved by straining in a paper towel-lined strainer over a bowl, although that’s what I’m trying to avoid by using the cheese. I mentioned above, using the dried Parmesan cheese in the green can helps the texture of the Parmesan Mashed Cauliflower because it takes up some of the moisture and adds a bit of heft. Using regular grated Parmesan from the block didn’t have the same results. I recommend a little garlic powder or roasted garlic and lots of chives for a bit more flavor. Whatever you do, don’t put butter or milk in the cauliflower as you mash or puree it, and using a food processor is definitely going to be your best bet for a good puree. A blender is going to need a little more moisture to get it going and will defeat the whole process of trying to get a drier mash. I don’t own a hand blender (for me they are just too fiddly and take too long to blend anything) so I can’t comment on how they might work. Parmesan Mashed Cauliflower – you can see this is still a bit of a “wet” puree w/o the heft of a mashed potato. Cauliflower used to be so cheap, but not anymore. Look for it on sale and avoid the cut up prepacked bags or trays of cauliflower. The price might not seem so outrageous at first glance but the price per pound usually works out to 4 to 10 times as much as buying a head of cauliflower, even if you’ve accounted for the bit of waste by discarding the hard “core” at the stem end. Cauliflower should be a creamy white color without any discoloration or greyish areas visible on the head. If, when stored, your cauliflower does start to brown up a bit and discolor, if you catch it in time, those areas can be trimmed off to reveal good cauliflower below. Any pantry staple like the Kraft Parmesan cheese is going to be a great item to find on sale. Here’s where it helps to find a good coupon matching site (even if you don’t use coupons.) They’ll alert you to the best sales for your store. Look for specials that run periodically, the kind of specials that say “Buy five items, get five dollars off.” Those specials are generally passed on by one brand. What they don’t tell you is that you can buy five of all the same thing or any combination. When an item like the Parmesan cheese lasts for ages, it can be worthwhile to stock up. If the sale includes cheaper items, it can be a great deal even if you don’t use them. Let’s say for instance, the sale might include the cheaper Kraft boxed Mac & Cheese. Pick up one or two of them (especially with coupons) and toss them in the donation bin. You will be ahead on the savings. Set a steamer rack in the bottom of a large pan, add water and bring to a boil. Add cauliflower and lid and steam 15 to 20 minutes, or until tender when pierced with the tip of a knife. Place rack in the bottom of the Instant Pot, add one cup water. Add cauliflower, trying not to pile up on the sides, no need to be perfect. Seal and set to High Pressure, 4 minutes. Quick release, check that the cauliflower is tender when pierced with the tip of a knife. For both methods, drain cauliflower well. Add to a food processor, working in batches if necessary, and process to a puree. Place in a bowl and stir in Parmesan cheese, salt & pepper, and garlic or garlic powder, if using. Drizzle with melted butter and garnish with green onions or chives. I’ll be sharing Parmesan Mashed Cauliflower at Fiesta Friday #242, cohosted this week by Jhuls @ The Not So Creative Cook and Jen @ Apply To Face Blog. You’re going to love all the bloggers that share their best recipes of the week at Fiesta Friday but do drop by and see Jhuls. You’re going to love each creative recipe and take sec to stop by and see Jen. She’s going to have you in stitches with a helping of her real-life stories along with each recipe. This entry was posted in Click here for Fabulous Food Posts and tagged Cauliflower, hearty sides, Instant Pot, parmesan, Side. Bookmark the permalink. It sounds fantastic! Thank you so much for the recipe. Since quitting potatoes three months ago (along with cutting out tomatoes, zucchini, beans, and grains), I’m feeling aWEsOMe! It can be really important to find out what works for you and your body! I know what works for me, I just don’t always comply, sadly! Thanks much! I’d still rather have mashed potatoes, but these are so much healthier! Good to know! Fresh is better tasting but I liked the texture better with the canned, so maybe it’s a little bit of personal taste! I hear you on cauliflower alone being no substitute for ‘real’ mash Mollie – funny my latest post was for the same mash – and I threw in plenty of spices and a little pumpkin too! Now that pumkin is inspired & I always love spice! I’m going to come check it out! It is a trend that isn’t going away, I hope! I love cauliflower! I still have not tried cauliflower pizza crust, though, and I might not ever, lol!! Thank you! Thank you for posting/sharing Cauliflower recipes. Thank you for being honest…REAL. That alone is so refreshing it provokes me into trying them. Besides, it does just happen to be right when I have a head of Cauliflower that I’m trying to figure out what to do with it. Hi Dawn, I appreciate the comment and thanks for stopping by! And after all that, I do hope you like them! I think it’s kind of like Vanessa, from Food in Books said, it takes a bit to get used to Mashed Cauliflower. Adding parmesan cheese is brilliant – I have to try this ASAP! Oh, gosh, I thought I already answered you! So to be so late in replying! Inho, cheese makes everything better, lol!! I agree with you 100%, soggy mashed cauliflower is a sad waste but well done mashed cauliflower with a nice bit of parmesan is a thing of glory! I usually strain, but next time I will steam or try the instant pot! Hi Carlee, so I thought I was nuts the first batch I made and strained! Now I feel better! This looks great. My family likes mashed cauliflower, so I’m going to give this a try. Thanks for sharing. Since I no longer have a big freezer and don’t freeze as much chicken broth as I used to, I’m relying more on that chicken paste. It’s stronger I think and a bit saltier and I think it would stand up to the strong taste of the cauliflower I’ll nake it that way next time! I too tried mashed cauliflower and wasn’t thrilled about them. It looks like you’ve added the right ingredients to make it really tasty! Carbs, I think, are out of fashion! Lovely recipe Mollie 🙂 Even though I am not really a fan of Cauliflower I will absolutely try this some time in the future…my husband will love it!! Hi Sophie, I think the cheese does improve it. 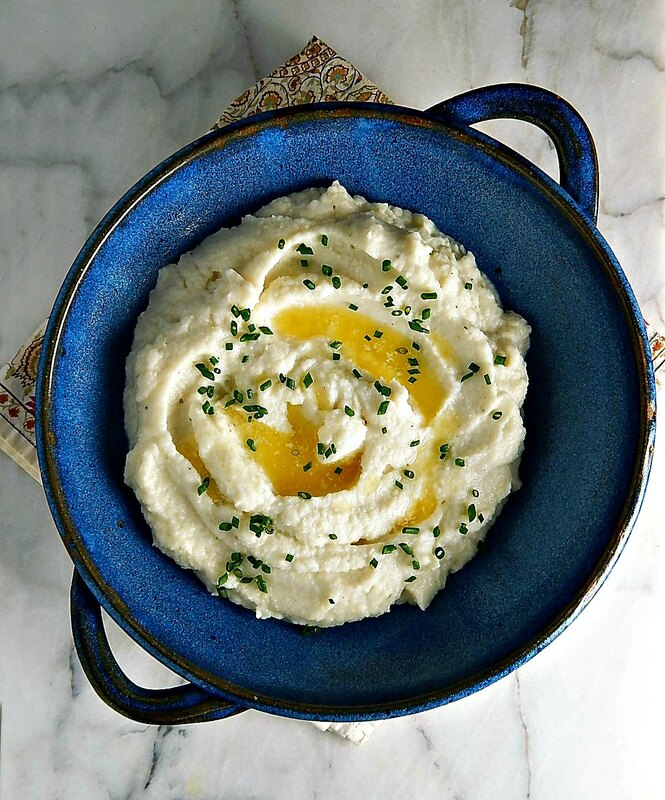 People seem to have either love or hate mashed cauliflower! Like you, I’m not a fan of mashed cauliflower, so far. Love cauliflower and will even eat a bit of potato/cauliflower mash. But in the end Mollie, give me mashed potatoes with a side of steamed cauliflower. But, this blogging belly of mine is not getting any smaller so, I’m going to give this a try. There are hazards to blogging, that’s for sure!! And even more hazards to eating!I couldn’t help but notice, either, that a lot of the TV chefs who are about my age are no longer young and slim, either. Just don’t eat the cauliflower mash thinking it will be like potatoes. I was even thinking a mash of half cauliflower and half potato might be a step in the right direction.